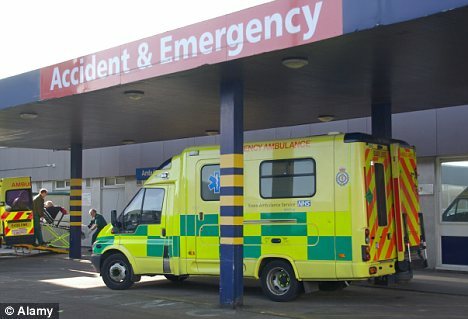 A shocking study has found those admitted as emergency cases are significantly more likely to die than those admitted during the week. It highlights the shortage of experienced consultants as a major reason for the excess deaths - meaning patients are often left in the hands of trainee doctors. More die because of short staffing in NHS hospitals than in road accidents, the survey concludes. The latest revelations mirror the problems with out-of-hours services for doctors. Two years ago, exhausted German GP Daniel Ubani killed a pensioner by administering an overdose while on his first ever shift in Britain. It led to an overhaul of out of hours services. Just weeks ago, another study found the out-of-hours GP service was not fit for purpose as trusts were not checking whether stand-in doctors could speak English properly and even whether they were medically competent. The latest report comes just days after a damning study found too many highly paid consultants were unwilling to work outside normal hours. The situation is so bad that only a dozen casualty departments in England have enough staff to allow them to run a 24-hour service at consultant level. Consultants' reluctance to work outside office hours is despite the fact they receive an average of £110,000 a year - up a third since the introduction of new contracts in 2004. Many receive lucrative bonuses as well. The authors looked at 4.3million emergency admissions in 2006. They found 215,054 in-hospital deaths with an overall mortality rate of 5%. This worked out as 5.2% for weekend admissions and 4.9% for weekday admissions. The figures were adjusted taking into account factors like age and socio-economic deprivation. This revealed patients were 10% more likely to die if admitted in an emergency on the weekend compared to a weekday. The latest study, carried out by Imperial College in London, looked at more than 215,000 deaths out of a total of some 4.3million admissions in 163 hospital trusts - the largest ever carried out in England. Its authors found that overall death rates were 5.2 per cent for patients admitted at weekends and 4.9 per cent for those admitted on a weekday in 2005/06. After taking into account other factors, they concluded the death rate for those admitted at the weekend was around 7 per cent higher than the weekly death rate. Mortality was higher at weekends particularly for those suffering from heart attacks, heart failure, stroke, some cancers and aortic aneurysms. The research, published in the journal Quality & Safety, found that if death rates at the weekend were the same as during the week, there would have been 3,369 fewer deaths. Lead researcher Dr Paul Aylin said: 'Clearly this is a significant number of people and we need to get to the bottom of what this means. 'Staffing levels are often lower at weekends, with fewer senior medical staff around and some specialist services are less available. In conclusion, the researchers said the higher than expected mortality may be linked to less consistent specialist services such as diagnostics at weekends - and a decrease in the availability of senior hospital staff. Another possible factor was that there are fewer community healthcare staff on duty at weekends. This means that cancer victims are more likely to be rushed to hospital, rather than dying at home. Dr Aylin said: 'Hospitals have been reassessing the working hours and rotas of their doctors. Earlier this week another report found that too many doctors working out of hours in hospitals were trainees rather than consultants. Last night Katherine Murphy, director of the Patients Association, said: 'No patient knows what time of day or night they may need medical attention. A spokesman for the Department of Health said: 'Patient safety must always be put first. 'It is for local trusts to ensure they have the correct staffing levels at all times.